The canal works have been progressing well with the concrete capping beam now largely complete. The next step is to install the fenders and then we can start to remove the platform which has been placed within the canal. We may need to do some works to the existing banks and bed of the canal to ensure everything is watertight but it shouldn’t be too long before the pumps can be turned off (not that they have been needed for the past few weeks) and the canal refilled. The highway works are also on track with the utilities works well underway. The first kerbs have been laid and the first section of new paving is now complete over Foxham Way Bridge. 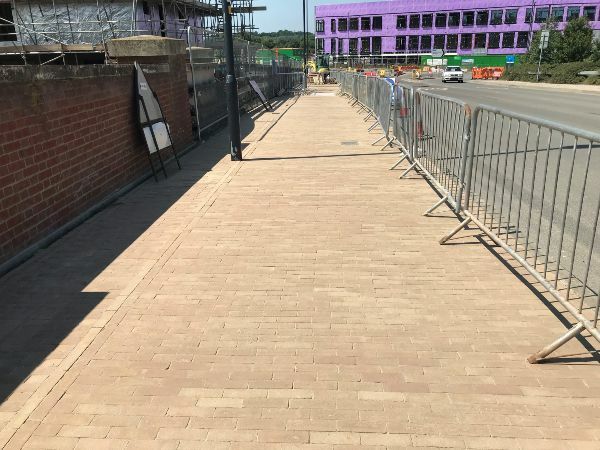 We are using different pavement materials in this area as well as down the central street through Canalside to signal to drivers that they are entering a more populated area and to be more aware of pedestrians. 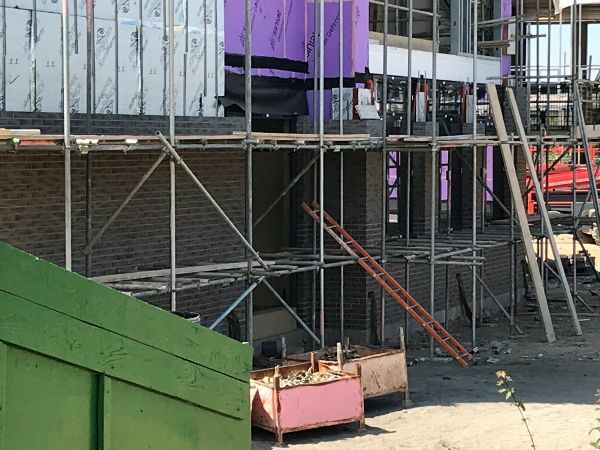 At the Deanery CE Academy the second wing and the sports hall now have floors and ceilings and the first bricks are being laid at the base of the section closest to the road. The building won't be purple for too much longer! 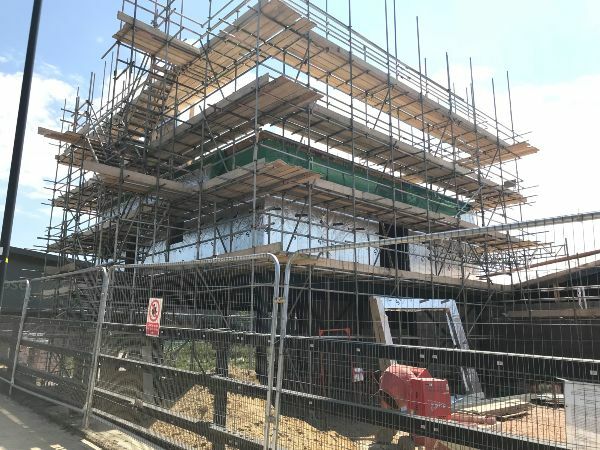 The roof is now in place on the pub/restaurant section of the Hall and Woodhouse building and work has also started on the taller accommodation block which sits closest to the road. Only the section which houses the staff accommodation will be built in this phase but it will eventually be extended along the road to include hotel rooms. 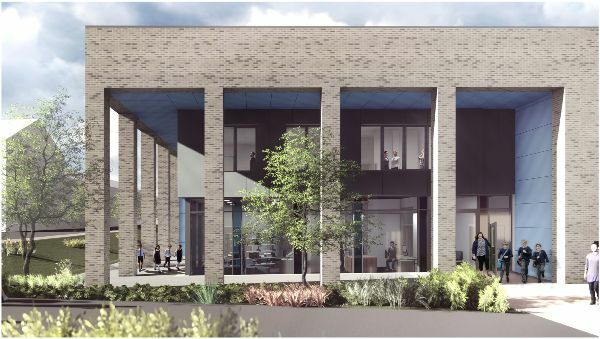 The planing application for the new primary school, which will be located adjacent to the secondary school at the heart of Canalside, has been submitted and is being considered by the planning authority. The school will be known as Kingfisher CE Academy and will be run by the Diocese of Bristol Academies Trust. Once constructed this will form a campus serving children from nursery age right through to sixth form and will allow the excellent facilities to be available to all age groups. 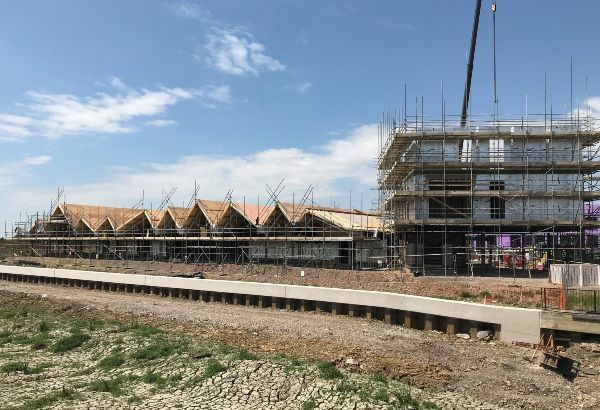 We now have a range of great facilities for new residents either planned or under construction and are working hard on pulling together the designs for the first housing to be delivered by Barratt and David Wilson Homes. This month we have in particular been considering the materials we will be using to construct the new homes. 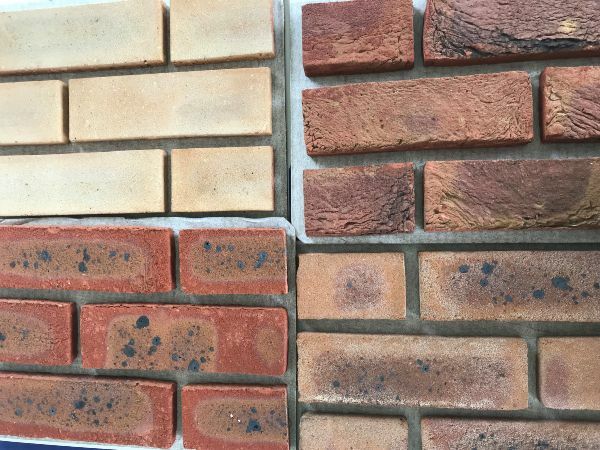 This is one of the areas which has been identified for additional investment in quality and we have accumulated a growing number of brick samples in order to find the best fit with each of the new character areas. Finally, if you'd like to get more involved with the new secondary school in Canalside the Deanery Board of Governors is looking for Community Governors to join the Board. If you live or work in the community served by the school and are interested in helping make the school a success, please contact the Clerk to the Governors deanery.clerk@bristoldiocese.org for more information. The deadline for written applications is Friday 27 July 2018.